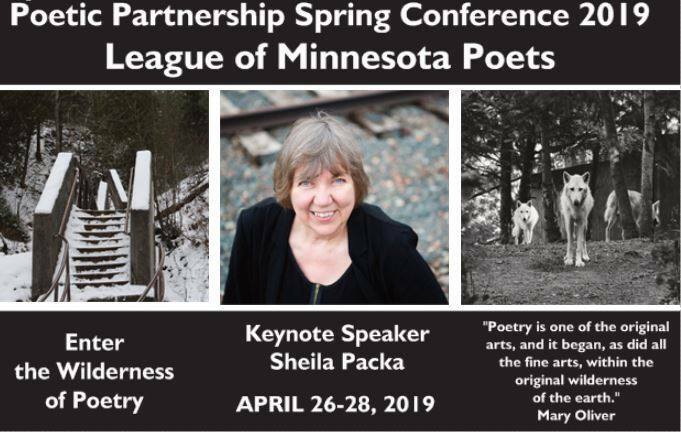 Register now for the 2019 Spring Conference a the Grand Ely Lodge featuring keynote speaker Sheila Packa. of $95.00 + tax. (please note, there is no cancellation policy at discounted rate). Bryan Thao Worra is a Lao American writer, who holds over 20 awards for his writing and community leadership including an NEA Fellowship in Literature. He was a Cultural Olympian representing Laos during the 2012 London Summer Games. In 2009 he received an Asian Pacific American Leadership Award from the governor’s Council on Asian Pacific Minnesotans. He is currently the president of the Science Fiction and Fantasy Poetry Association, a 40-year old international literary organization celebrating the poetry of the imaginative and the fantastic. He also holds a 2011 Youth Media Innovation Award from the University of Minnesota Human Rights Center and won the 2014 Elgin Award for Book of the Year from the Science Fiction and Fantasy Poetry Association for his collection “Demonstra” (Innsmouth Press, 2013). He came to the United States in 1973 as the adopted child of an American pilot flying in Laos during the Southeast Asian conflicts, and grew up across the US including Montana, Alaska, Michigan, and Ohio. He studied under both Lutheran and Waldorf education systems in grade school. While he has been writing and creating since he was young, his journey as a poet is typically considered to have begun in 1991. This year marks the 20th anniversary since he moved to Minnesota and began some his most significant work as a poet, working to help many refugee communities reconstruct their literary voice in diaspora. This is Boom-Bap from the stars at the pyramids. A dance party with indigenous kings, quantum physicists, and your little cousins. These are lyrics that school, uplift and capture the imagination. They reprimand wackness. This is the love story between heritage and irreverence, the make out session between education and rebellion. A fist fight between what is and whats possible. A heavy blow from sound logic upon hateful ignorance. Love over fear. and “The hardest working, most unjustly slept on artist in the Twin Cities”….This award winning hip hopper is a Twin Cities Native, Chicago transplant, MC, Poet, Producer, Engineer, Educator, Visual Artist, Actor, Thinker, Lover and one heck of a cook. He received a 2013 VERVE Grant from Intermedia Arts, a 2017 Cedar Commission from The Cedar Cultural Center, and was a semi-finalist of the Saint Paul Challenge for the Million dollar idea to make Saint Paul Great. SEE MORE is currently on the TruArtSpeaks and COMPAS Arts MN artist rosters teaching rap, spoken word, hip hop music production, and social justice. He serves on the board of the Metropolitan Regional Arts Council, where he is excited to continue to find new ways to connect with and contribute to Minnesota’s art and music scenes. SEE MORE PERSPECTIVE aims to inspire, uplift and open doors to possibility and imagination with an invitation to self discovery through meditations on community, history, and the expression of pure imagination. Prez, Sage Francis, Michal Franti, Atmosphere, De La Soul, The White Stripes and many more.